Start and run camera-sharing sessions from your web browser. 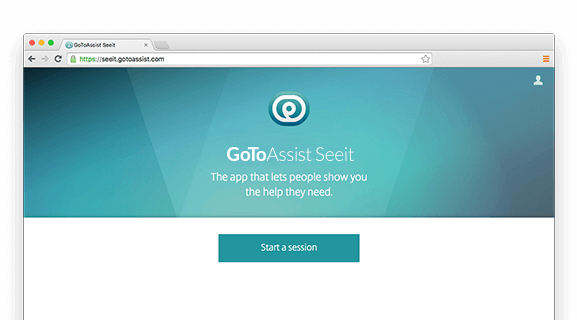 GoToAssist Seeit is a simple browser-based tool. You don’t have to download a desktop program. You don’t have to configure security permissions or firewalls. You don’t have to do anything but provide the best support you can. Getting into a live video session is quick and convenient. One, sign in to the web portal. Two, click “Start a session.” Three, invite a customer. And that’s it. In seconds, you can see what’s wrong with your customer’s equipment without traveling anywhere. GoToAssist Seeit supports English, French, German, Italian and Spanish. If your web browser is set to one of these five, the web portal, in-session instructions and post-session pages will automatically translate into the correct language. See what your customers see through their mobile device camera.